Here, in an idle moment, is a Wordle of the words I use most often in this blog. There’s an interesting and, I suspect, common debate going on at Bath Spa University at the moment, regarding the pros and cons of providing online feedback to students for their written work. Practices vary across the institution; every academic School has some staff members who use online essay feedback and others who provide feedback exclusively on paper (although our academic regulations require that all staff use Turnitin for plagiarism detection). The arguments on both sides are easy enough to summarise. Those in favour cite timeliness of feedback, support for disabilities, higher takeup rate, staff time efficiency, student expectation, lower carbon footprint, legibility of feedback, increased wordcount and accessibility of feedback. Those against cite difficulty with the software interface, staff time efficiency, the learning curve required by staff to use it, physical issues using computers and displays, and the ‘academic freedom‘ of staff to defend pre-Internet working practices (of paper-based marking). Considering that this article is originally being written for a blog site (bathspaweb2.edublogs.org) about the benefits of e-learning, it’s no secret that I consider that the pros outweigh the cons. But my reasoning is not based on tech-evangelism – rather, it is because, like all of us, I have devoted a large part of my professional life to ensuring that my students have the best learning experience possible, and experience has shown me that online marking enables students to receive feedback that is more timely, relevant, extensive and clear than the equivalent paper-based method. Does this require academics to learn new skills? Certainly. Can it improve the student learning experience? I believe so. This is not to say that all assessment feedback is better online. Feedback can and should take many forms; in my own formative and summative assessment I use face-to-face tutorials, group seminars and peer assessment, all using verbal protocols that would have been familiar to any 19th-century academic. But I also use Skype, Google talk, pdf annotations, Jing, Camtasia, Zotero, YouTube , emailed MP3s, Turnitin, Minerva (our VLE), and various blogs, sites and wikis. In each case the feedback tool, whether analogue or digital, is selected with the goal of giving students the clearest and most helpful feedback to support their learning. I personally abandoned paper feedback in 2003, initially for reasons of timeliness (emailing feedback to students was simply quicker and easier) and later for reasons of increased pedagogical benefit. Let’s start with a scenario that will be familiar to anyone who’s ever marked a pile of paper essays. We dutifully annotate every paragraph, highlighting well known spelling/grammar errors such as possessive its, splice commas and providing notes to help students to improve academic citations. [This article is only being distributed electronically. If it were in paper form, the three hyperlinks in the previous sentence directing the reader to additional online learning resources would be unavailable]. At the end of a long, gruelling day (or week, or month!) of marking, we have a large pile of paper on our desks. We then pass these marked up essays back to the students – often some months later if it was a summer submission – or leave them in an office for collection. Sometimes students collect work and read the feedback, and sometimes they don’t. You only have to prowl the corridors of any building on any campus to find box files containing marked work that students have not collected. I know of one colleague who, at the end of a full marking/handback cycle, was left with 75% of the papers not collected by returning students, who had ‘moved on’, or for whatever personal reasons had no interest in reading the feedback. He was heartbroken – all his detailed and diligent work was wasted because the very people he was trying to help were refusing to engage with his preferred method of communicating. And good quality online feedback can provide opportunities for additional learning beyond the limitations of paper marginalia. If a student’s essay fails to reference important academic literature in the field of study, our feedback can contain hyperlinks to further reading. If the essay makes a basic error of grammar, style or citation, we can provide hyperlinks to websites and articles that will enable the student to improve these areas for next time. I have a 500-word ‘rubric’ set up on Turnitin’s Grademark facility so that every time students misuse splice commas I can drag and drop a detailed explanation of how they can avoid making this error in future. The other consideration is the demographic of our current and future learners. Over 90% of BSU students own their own laptop, and 100% have on-campus web access. Many primary schools now use a VLE for key stage 2, and most secondary schools provide online feedback of some sort through VLEs, including Moodle. Teachers throughout key stage 2 and 3 are setting up their own blog sites to support student learning and encourage online interaction. When these children become young adults and enter HE, we can speculate that an 18-year-old first year undertaking our assignments would be somewhat bemused – perhaps even unimpressed – to receive an A4 printout with handwritten comments, three months after hand-in. But good quality e-feedback, just like good quality teaching, takes training, skills and experience to deliver. And ‘late adopters‘ (Rogers, 1963) are often left understandably confused by the array of options and the difficulties of getting started. The staff learning curve for a lot of e-learning tools – and I include our own Blackboard/Minerva solution – is far steeper than it should be. As academics we’re thrown in at the deep end with these tools, and the designers of the tools are often so preoccupied with adding features that usability suffers. And although we have some excellent staff training support in our universities, the interfaces should not be as difficult as they are to operate. No-one asks for training using Facebook or Google, because these companies have poured $millions into improving usability. Setting up a Turnitin assignment in the Grade Centre is unreasonably fiddly and complicated. This poor usability creates an apartheid between early and late adopters, with the risk that only the former may provide e-feedback to students. The result is that students become disgruntled that they do not get the same quality of feedback from all staff. The challenges of software usability and staff IT literacy are very real barriers to students receiving good quality feedback. As assessors, there are two directions we can choose. If we consider that the benefits (to our students) are worth the effort, we’ll forge ahead and confront our difficulties as learners of a new ‘language’, even if the online tool is a bit clunky and difficult. If the learning curve is too great for us, we will resist, and will find a way to intellectualise disengagement – ‘academic freedom to mark however I like’, ‘I like the tangible feel of paper’, ‘I get RSI sitting at a computer’, ‘it’s worked for me for 20 years’ etc. Let’s look at these arguments one by one. I suggest that the term ‘academic freedom’ may be being misused here. Our own UCU definition of the term covers five areas, all of which relate to the intellectual concept of academic freedom (and all of which I would defend as vehemently as the next colleague). None of them (nor any of the academic literature) refer to the freedom to choose the administrative method by which written feedback is delivered. The ‘tangible feel of paper’ is a personal preference that doesn’t provide an observable student benefit, and in any case, staff and students can print online materials if they need to. As regards the ‘RSI argument’, physical issues connected with computer usage must of course be treated seriously by academics and organisations, and anyone with a disability of any sort should be – and is – supported in their role. Recently, a member of my team who suffered from back problems told me he was unable to sit at a workstation to deliver online marking, and needed support and advice. We provided him with a portable MP3 recorder and a short training course in how to upload audio files to the VLE. His students received online verbal feedback that was far more extensive than the paper based equivalent, and they made very positive comments about this perceived improvement. The ‘it’s worked for me for 20 years’ argument may be self-centred rather than pedagogical, but it does provide useful evidence of the need for high-quality staff support. If academics have a responsibility to their students, so managers and institutions have a responsibility to their staff. Given that opposition to online marking is almost always expressed by those who do not yet have the skills to deliver it, there is clearly a staff training issue to be addressed. And this needs to be more than a one-off Friday afternoon showing a small group how to set up a TurnItIn dropbox. Generic ongoing IT literacy must be supported and maintained. In the digital age, communicative teachers need to be able to embed a video, operate simple content management systems, resize a JPEG, make pdfs, share collaborative documents, take a screenshot, store files in the cloud, manipulate a search engine’s advanced features, record an audio file, and most importantly, provide links to other sources of learning. And the challenge of supporting digital immigrants (by which I mean all of us older than about 35) will never be greater than it is now. 15 years ago it wasn’t an issue – students were expecting to receive paper feedback, and in any case the online tools weren’t good enough to provide a better alternative. 15 years hence it won’t be an issue – the majority of the teaching workforce will be naturally digitally literate, having been born into an online society. So the tension we see now, between early and late adopters, will naturally disappear as technology, staff literacy and student benefit combine. If you’re reading these words any time after, say, 2016, you’re probably wondering what all the fuss was about. 2012’s intake of students were born around 1994 and have only ever known a wired world, at home and at school. By contrast, most of us started our professional lives in a pre-Internet age, and have had to adapt our practices – as teachers and as learners – as new tools have become available. The Internet is a new communication tool for our society, enabling instantaneous transfer of information and ideas from one to many, from many to one, or from many to many. As academics we are professional communicators, and many of us are understandably excited by the current and future opportunities for better communication with learners and colleagues. But we’re learning a new language, and we must work together to ensure that our fluency is shared. You’ll notice that this article isn’t Harvard referenced. Rather, it is hyperlinked. Harvard referencing was invented around 1881 as a system of enabling scholars to follow paper-based trails of information by providing enough metadata about a work to enable it to be located in a physical library. Most other citation systems predate the Internet. Hyperlinks were invented in the mid 1960s and are the primary method by which users navigate online. It may be interesting to speculate whether these long established citation systems decline as the same rate as the need to access information in its physical form. Here’s a copy of a post from my Web 2.0 blog. In my own academic research work (PhD in progress until 2014) I try to keep all my data and documents in The Cloud. This is partly borne out of enthusiasm for e-learning generally, but mainly out of practical necessity; my bibliography is currently around 200 items, and I expect it to hit 1000+ eventually. Some of these works are paper-based books, but most are electronic journal articles (stored as indexed, searchable pdfs, with the attendant bibliographical metatdata available to the citation tools available in Zotero). I work on 5 different Macs and an iPhone, and although I have a paper-based library at home (with, like,real bookshelves and everything) this library is, of course, non-searchable by text string, slowing down my research productivity. My supervisor is a very experienced and knowledgeable academic who tends to work in a very different way i.e. using paper-based books and printing out journal articles. We understand each other in this respect; he often champions the depth of thought needed to sit down for a long reading session with no distractions; I am inspired by the intellectual and conceptual ‘branching’ that can be achieved by plundering an academic’s bibliography and exploring ideas online – e.g. finding Google book previews to develop further reading. To contextualise the forthcoming rant about the frustrating limitations of Amazon’s new Kindle For Mac (and iPhone) application, here are some of the characteristics of physical books vs on-screen documents. If you agree with this (I hope uncontroversial) summary of the characteristics of the two media, you’ll agree that the first and last rows represent the advantages of using books for research; the rest represent the advantages of using electronic means of study (summarised by but not exclusive to the category ‘.pdfs’). My personal choice is always to go with e-media for these reasons, but it’s exactly that – a personal choice. Many highly effective and more high-profile academics than I are still using paper-based research. So, to the issues with Kindle. As you see I am already a primed and enthusiastic user of e-learning and an on-screen reader, so yesterday for the first time I found an academic text on Amazon that was available as an e-book download for Kindle. Previously, whenever I’d discovered a research text that was in print, I’d either schlepped over to a library (creating an ever-increasing carbon footprint) or bought the book online and waited for the post to arrive a few days later (increasing the postal service’s carbon footprint – but I’ll leave aside the eco-angle for now). The book (Creativity: Flow and the Psychology of Discovery and Invention by Mihaly Csíkszentmihályi) showed up as being $12.01 as a Kindle download. Not bad for a large-ish specialist interest book, I thought, and way cheaper than my local Waterstones, until I looked at the row below and saw that the paperback version was $8.99. How can it possibly be cheaper to produce a physical book than an e-book – do the Kindle R&D department staff have a particularly luxurious office building? Never mind, I thought – at least I’ll get it straight away without having to wait for shipping from the USA, and I’ll have the advantage of being able to read the book on the phone too, so I’ll pay the extra and get the download now. Literally one mouse-click later, the book was on my Mac desktop and syncing merrily over the web to my phone, with Amazon’s legendary e-store usability making it an effortless online purchasing experience. 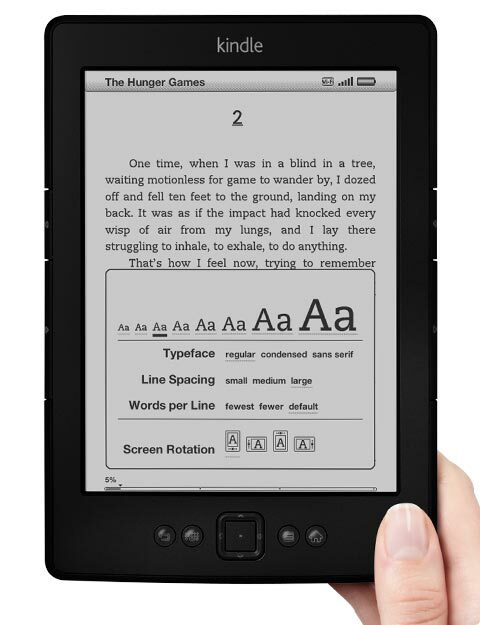 The Kindle app allows you to read the book, and change the font size on-screen. It remembers where you left off reading, and lets you put a manual ‘bookmark’ in the text. And that’s the whole feature set. No text search, no copy-and-paste, and no indexing – exactly, in other words, like a real book. It appears, then, that Amazon have taken the e-book metaphor to its logical extreme. They have managed to reproduce faithfully all of the disadvantages of the physical book medium online. So much so that even when I’ve bought a Kindle book, I find myself going to Google Books limited preview in order to text-search it. Here’s the table updated to compare the Kindle to the printed book. The last row, of course, is key to all this. If Amazon enabled all my wish-list of features, the copyrighted object (the text itself) would be easy to copy and distribute. But these are specialised works with a small sales volume in any format – if Amazon made the usability of these e-books greater, more academics would buy them, especially if the price point was more realistically tied to the production cost. My point is that the Kindle e-book represents an inferior product to the physical book – at a higher price – and it provides fewer features for the reader than a pdf. Even as an e-learner I do actually like the physical experience of having a book – it’s just that the other advantages of e-text outweigh this short-term tactile benefit. Kindle/Amazon should learn from the music industry’s experience in the early 2000s – consumers will not tolerate Digital Rights Management for long. Here’s a rare thing – a post about e-learning where I’m not wildly enthused! Since 2006 I’ve been unable to figure out whether Second Life is a huge opportunity for live real-time collaboration in HE, or whether it’s a declining online video game with a clunky interface that encourages trivial levels of thinking. My dilemma seems to be shared by the sector, too. Second Life actually predates Facebook but hasn’t grown at anything like the same rate; in fact, adoption of it by HE stakeholders seems to have drifted a little. In 2007 UCAS bought an ‘island’ (a server) in SL – here’s a picture of my avatar (Jon Duvall – find me in-world sometime if you’re an SL user). Look carefully at the picture. You’ll note that the island is currently advising students that places are still available… for 2007 entry. Think about SL intellectually and you can see immediately why some early-adopter academics got excited about it. It’s a metaphor. Everything in it is a metaphor – even onself. And the quasi-social interactions in-world have obvious parallels in pre-Internet higher education. Academic researchers, intoxicated by the SL ‘sociology metaphor’ perhaps, were keen to explore opportunities. 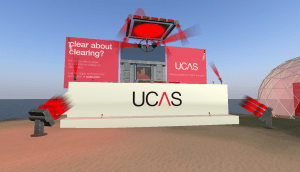 There are even some in-world conferences – and the JISC were keen to fund these investigations so we could all evaluate the possibilities of the technology/game/metaphor/experience. I’ve met songwriters in-world, of course, but never written a song. I’ve met researchers but never read one of their papers. In ‘first life’ (i.e. my real lectures) I demo’d SL live to a group of students back in 2006 (we attended a covers gig in-world with a real singer and an animated avatar), and we discussed whether it might be an intriguing marketing opportunity for nascent bands and artists. A few tried it – but no-one got any more gigs or punters as a result (contrast with myspace and Facebook, which is the bread and butter marketing platform of every new musician). Lots of Universities signed up to SL in 2006-7. Here I am at the deserted campus of Southampton University. They took an innovative approach, creating a remarkable (looking) campus in-world. It seems, in Southampton’s case, like their primary strategic motive was marketing. And (IRL) they have an impressive campus. 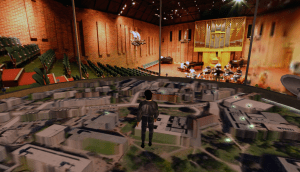 Here I am walking over an interactive 3D map, which builds the environment of the building you’re in around your avatar; this is their concert hall. It’s clear that someone has seen a possible marketing opportunity to be directed specifically at overseas students. 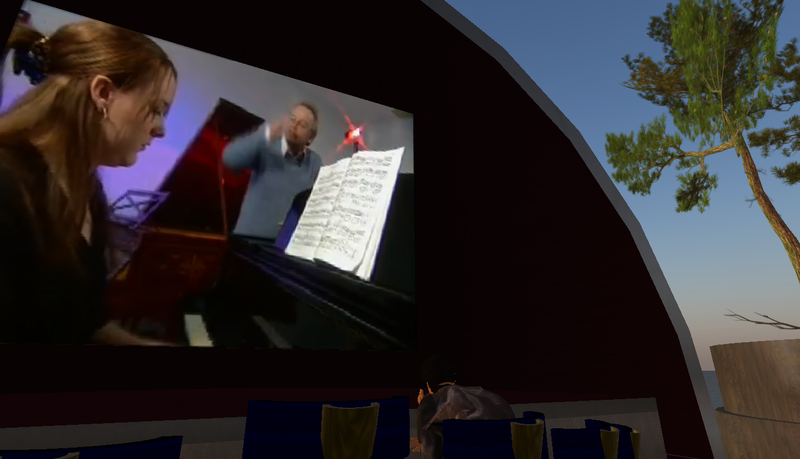 Sitting in the outdoor in-world cinema auditorium, my avatar watched a Quicktime video of some international music students discussing why they like studying at Southampton. My perception of Second Life is that it’s an amazing technical achievement and an intellectually fascinating social concept. But any user (or learner) benefit it has can be provided more effectively by other online means. Further, the bandwidth requirements of the environment combined with its real-time nature mean that it’s actually a very poor medium for delivering information, learning or social interaction online. Contrast SL with Facebook (as an example of online interaction between people), which came out around the same time (2006-7). It’s worth noting that points 1, 2 and perhaps 4 are also provided by VLEs. 42,000 users are currently using SL as I write this, and 1.3 million users have used it during the last 60 days. More than 120 million users log on to Facebook at least once each day. Of course, SL & FB are very different tools – but I think they show an interesting contrast between the relative popularity of synchronous and asynchronous interaction. IT colleagues often get very excited about the idea of webcasting a lecture, but I can’t see the point of going through all that hassle – the balance between technical setup and user benefit isn’t right. If you’re going to arrange for lots of people to be in the same virtual ‘place’ simultaneously, you’re giving participants a slightly poorer (and often technically underwhelming) version of a real life lecture. You’ve saved them some travel, but beyond the environmental advantage of reducing travel, you haven’t really enhanced learning. Webcast a lecture and people can access it once. Record it and post it online and people can access it forever. I hope this blog entry demonstrates that despite my often breathless evangelism for e-learning and all things Web 2.0, the SL example shows that just because something is online, it’s not necessarily a better tool than its traditional equivalent. When I teach rock bands about arranging, we work ‘live’ with guitars and drum kits – because they’re the most efficient tools for the job. Even the live lecture/seminar still has a place, despite its limitations as a method of information exchange, discussion and enquiry. But if the lecture has a part to play in 21st century learning, so does the blog, wiki, BBS and email exchange. And these asynchronous methods provide positive advantages for the learner, precisely because they can be accessed at the user’s convenience. And that, really, is my (e-learning) point – what web users seem to want is asynchronous interaction. When we build e-learning objects we need to empower students by giving them access to learning when the tutor is not online. And this means generating great content, and ensuring people can build online communities around that content – and around each other.